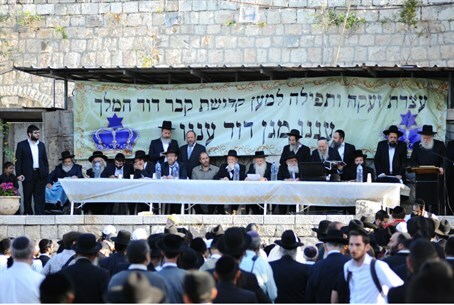 Nationalist activists Ben-Ari and Marzel call for protest at Zion Gate to prevent 'precedent for Church control'. Former MK Dr. Michael Ben-Ari and nationalist activist Baruch Marzel are arranging a protest against Pope Francis's Mass prayers, which he is to hold Monday afternoon in the "Room of the Last Supper," located in the David's Tomb Compound. The location of the room is one floor above the Tomb of King David. Writing on Facebook, Ben-Ari condemned the praise being heaped on the pope in light of reported plans to allow Catholic prayers to be held regularly at the holy site. The move would prevent Jews from entering the site, given that Jewish law forbids using a building used for idol-worship, a category Catholic worship with its effigies falls under in Jewish law. "Against the festival of sycophancy, we stand and protest against the handing over of David's Tomb to the Church's rituals," declared Ben-Ari. "Under the cloak of 'love and brotherhood,' the state of Israel is allowing Christian Mass services at David's Tomb, something that was not allowed to Christianity for hundreds of years. It is allowed today for the first time, and will be a precedent for Mass every Sunday on the site, as a means of the Church's control over the David's Tomb Compound," wrote Ben-Ari. In a call for action, Ben-Ari attached a post from Marzel's Facebook, in which he wrote that he would demonstrate at 4 p.m. at the Old City's Zion Gate, opposite David's Tomb. The protest is timed for the pope's arrival through Yafo Gate. Authorities are unlikely to take kindly to the idea, however. Police have already taken a no-nonsense approach to protests by both Jewish and Muslim groups against the pope's visit, including the arrest of 41 Jewish activists between Saturday night and Sunday morning for protesting the reported plans over David's Tomb.